San Diego’s Longest Running Multiple Neighborhood Taste! Enjoy tantalizing tastes from more than 40 Restaurants located throughout the Gaslamp Quarter, Headquarters, City Center, and East Village neighborhoods. Tasting Tickets can be redeemed at Will Call on the day of the event. Complimentary Shuttle Service available throughout the Taste. 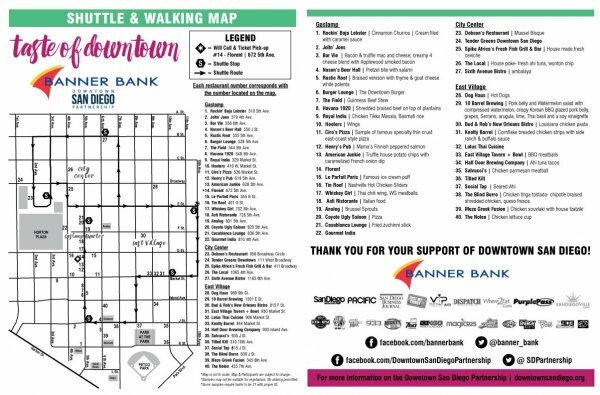 The 25th Annual Taste of Downtown is brought to you by Banner Bank. Sample-sized bites allow you to explore all Downtown has to offer, without the commitment of a full menu. Scrumptious treats will take your taste buds on a delicious journey as you venture to each venue. Discover your new favorite restaurant or sample a new cuisine. Don’t miss out on the chance to find your tasty moment! Whether you’re building a home or growing a business, our bankers work hard to get to know you and your needs. That’s essential to building trust and offering tailored solutions to support your success. Relationship banking has been our approach for more than 126 years. It’s one reason Forbes ranked us 29th on their 2017 list of America’s Best Banks. It’s also why we repeatedly receive a 5-star rating from Bauer Financial. Thank you to our media sponsors!